Do two bad movies somehow make for a good movie when smashed together? In this particular case, it seems like it. A new fan trailer has combined the 1997 Spawn live-action movie with the lamented Ghost Rider: Spirit of Vengeance and, somehow, it makes for a pretty cool looking movie that many of us would actually want to see. YouTuber Stryder HD, who quite regularly cuts together trailers for cool movies that don't actually exist, brings us this insane Spawn and Ghost Rider crossover. Titled Ghost Rider v Spawn: Eternal Darkness. The trailer envisions that Spawn comes back to life, much like in the 1997 movie, but this time, he is sentenced by the Devil himself to kill Johnny Blaze. This leads to a whole lot of firey fighting goodness with a whole lot of bad CGI. Despite the rough special effects, the premise is cool and it would really seem to work. What is perhaps most interesting about this trailer is that, if we ignore some of the bad and outdated effects, this could really work. However, the source material for the trailer is pretty rough. The original Spawn live-action movie is bizarre and confounding in a bad way and doesn't hold up by any standard. As for Ghost Rider: Spirit of Vengeance, this is easily one of the worst comic book movie sequels ever made, and it isn't as though the first movie is really any good in the first place. Yet, somehow, Nicolas Cage and Jai White could've maybe come together at one point to make this work. Related: Will Hulk, Punisher, Blade & Ghost Rider Get TV Series? Despite the fact that Ghost Rider is a Marvel Comics title and Spawn is an image comics title, there is no reason this couldn't work. The two characters are both cut from the same cloth, despite some pretty serious differences. If a deal could be struck, this could make for a really great R-rated comic book movie. It isn't likely to happen, but we can dream. Granted, if somehow, someway it ever were to happen, it certainly wouldn't be Nicolas Cage and Jai White playing the roles. Even if we don't get a movie, maybe Marvel and Image could do a limited comic book series of some kind? 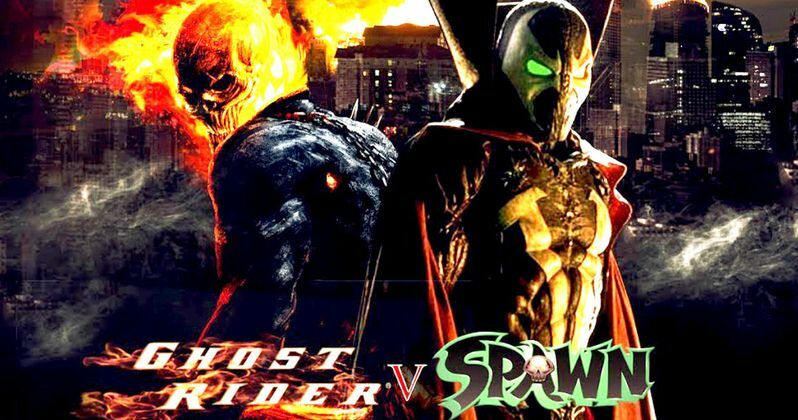 As far as Ghost Rider and Spawn go, we are going to get some more of them in live-action, but just not together. The Robbie Reyes version of Ghost Rider has been showing up on Agents of S.H.I.E.L.D. lately, and there were rumors a while back that Netflix was looking to possibly do a series based on the Johnny Blaze version. With the Untitled Spawn Reboot, creator Todd McFarlane has finished a script for a new live-action movie, which he also wants to direct, and has promised some news on the subject during San Diego Comic-Con. We'll see how that shakes out. For now, you can check out the Ghost Rider v Spawn: Eternal Darkness trailer for yourself below. Blade, Ghost Rider & Moon Knight TV Shows Happening at Netflix?